The Future of Media: Can Publishers Become Media Platforms? From left: Vivian Schiller, Christina Farr, Charlene Li, Stephanie Losee. Social media platforms Facebook, Medium, LinkedIn, Twitter, Apple are competing for traditional media publishers to use them as distribution platforms and in some cases are offering 100% of advertising revenues. Certain publications now rely on the majority of their traffic from these media platforms. But is this an equitable partnership? Vivian Schiller, a veteran news executive at NYTimes.com, NPR, Twitter, CNN and now Executive Editor-in-Residence at PR firm Weber Shandwick, introduced these and other questions as moderator at Weber’s second Future of Media panel series. 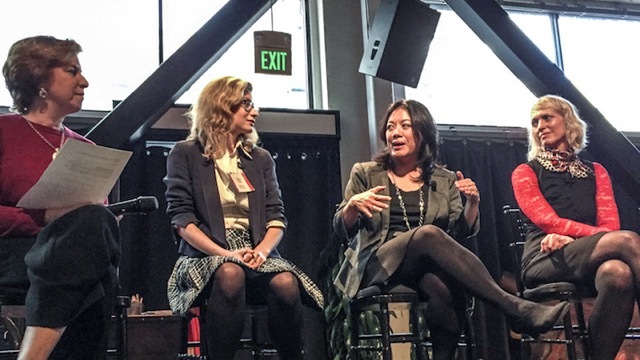 The San Francisco event featured five additional women and one man: Christina Farr, reporter for Fast Company; Charlene Li principal analyst at Altimeter Group; Stephanie Losee, head of content at Visa; Jillian D’Onfro reporting for Business Insider; and Karen Wickre, content strategist, and Simon Rogers, a Data Editor at Google. - Christina Farr spoke about how she loves Twitter and how it helps her work. She prefers to engage with readers on Twitter and wouldn’t know what to do if Twitter went away. She also spoke about metrics and was trying to decide if she wants to know how few or many read each article. She was concerned it might affect her motivation if she spends several days on an in-depth article and few read it. - Charlene Li made a good argument for publishers to become media platforms in the same way as the social media platforms don’t own content but own the network and community. She pointed out that reporters publish and then engage with readers yet they should engage first, figure out what the readers want before generating new content. She also said that visitor data publishers collect was valuable and could be sold. She pointed out that there are many creative things to be done with media and she was exploring a novel design for an e-book that would let people skim but also dive into it more deeply. - Stephanie Losee spoke about asking fundamental questions about content such as “why do you want to reach this person?” She said metrics needed to value the reader and that trying to reach a large audience often results in lost focus. Higher numbers are not better. The right content will always find its way to the right person and publishers should offer ways for readers to jump down the rabbit hole and go deeper into a subject. - Simon Rogers spoke about his job at Google and using Github to share infographics and other media assets with anyone that wants to use them. He and his colleagues publish news stories every day based on data collected by Google. He said that his newsfeed is personalized via his friends on social media. - Jillian D’Onfro said that Business Insider was trying to get readers to its web site but also using social media platforms, keeping a foot in both puddles. She said that for now, things were working out. She isn’t a big fan of video and prefers to write her news reports than present them via video. - Karen Wickre spoke about the need for consistency in content and doing it again and again. There’s a cumulative value in publishing good content every day. Success comes to those brands that plug away at it. It was a large panel but excellent moderating kept everyone in the conversation. The panel covered a large number of topics but in the end it couldn’t decide if social media platforms were a good thing or not. Foremski’s Take: The trouble with tech media platforms is that they are made by engineers and they don’t understand how content is produced and how much it costs to make. Time and again, content ventures by engineering-led firms fail. Invest in editors or engineers? Yahoo is a good example of a platform making large investments in content and then pulling back — it has done this three times. When accountants look at the cost of creating content versus the cost of creating code — which can be scaled across the entire platform — it is always an unfavorable comparison. Offering publishers 100% of the advertising revenue on a page is the strongest signal that these platforms don’t understand the costs of traditional media publishers. Giving 300% wouldn’t come close to covering the expense of media production. Yet these platforms believe that they are part of a virtuous cycle in which they drive huge traffic to media companies who then are able to reinvest the money in producing more content. But in practice there is no virtuous cycle because the traffic they bring is low quality and hard to monetize. Traditional media companies have consistently been several years behind in understanding the economic trends in their business — it’s too late for them to become broad publishing platforms. Charlene Li’s advice to publishers to become a platform is sensible but unfortunately it’s not realistic. To compete as a platform requires a scale that none of the traditional publishers have, or could build to compete against the engineering-led social media platforms, which were designed for massive scale from the start. The title of the event was “Social Channels and Traditional Media: How can they Co-Exist?” They certainly do co-exist — for now. But how long can traditional media continue to exist? Social media platforms have helped raise readership numbers for many titles but their revenues continue to shrink. In the old days, more readers always meant more money but not so in the world of digital media. Publishers have to run ever faster just to keep still because the social media platforms have flooded the market with cheap advertising that continues to deflate. The social media platform and publisher business models are miles apart. The platforms can survive on tiny amounts of revenue per page but the traditional publishers can’t. It’s an unsustainable relationship that offers no future for traditional media. Check Tweets with the hashtag #FutureofMedia and #TFOM16 for additional reports on the event.